ASU head coach Todd Graham's frustration is evident during Monday's 37-23 loss to Texas Tech in the Holiday Bowl. The Sun Devils finished with back-to-back losses and a 10-4 record. Arizona State coach Todd Graham used such words and more to describe Monday’s 37-23 loss to Texas Tech in the National University Holiday Bowl, and we can only presume his word choices were harsher behind closed doors. ASU put forth its worst performance of the season, marring an otherwise impressive 2013 with a big disappointment in San Diego. Graham it made a point to praise his strong senior class before anything else and repeatedly spoke of a new standard in the program. But none of it could cover up the immense letdown of losing to a team they certainly should have beaten. The loss does not undo the many positives of the 2013 season, but it certainly overshadows them in the short term. Yet you can be sure Graham will use the loss as a teaching moment. ASU (10-4) handled success on a big stage — wins over Washington and UCLA, the latter to clinch the Pac-12 South — but it hadn’t handled losing on the biggest stage and seemed to have not moved past its loss in the Pac-12 title game. The Sun Devils clearly overlooked Texas Tech, perhaps because they had come one win from a Rose Bowl berth and believed they were far superior. The chance to win 11 games for just the sixth time in school history should have provided ample motivation, but ASU had not mentally recovered from its title game letdown. Now, it’s Graham’s job to make ASU stronger because of the failure. That will be especially challenging with ASU losing at least 11 starters, eight of them on defense, but the progress made this season gives ASU a solid point from which to start. "The minimum expectation now is 10 wins and winning the Pac-12 championship," Graham said. "I’m bound and determined to build a national power here, and we’ve got a lot of work to do. We knew that going into the game and we obviously know it going out of it." The 2014 season is a long way away, and before we look toward it let’s rewind once more on ASU’s loss to Texas Tech. Despite getting no points out of a first-and-goal situation just before halftime, ASU made it a game again on the opening drive of the third quarter, scoring to pull within a touchdown. Texas Tech quickly killed ASU’s momentum with a 90-yard kickoff return for a touchdown to reestablish its two-touchdown lead, and ASU managed just a field goal the rest of the way. Quarterback Taylor Kelly. There wasn’t much to ASU’s offense Monday night. It was pretty much running back D.J. Foster and Kelly. Both ran for over 100 yards, with Kelly racking up a career high 135 yards and a touchdown. Kelly recovered a first quarter fumble and ran it for a career-best 51 yards and later scored on a 44-yard run. He might have had fewer rushing yards if he hadn’t been forced to scramble repeatedly as his pocket collapsed behind a poor offensive line performance. Safety Damarious Randall. Of Randall’s team-high 11 tackles, one went for a loss, one forced a fumble and another saved a touchdown (which Texas Tech got a play later anyway). His forced fumble came on a kickoff, and ASU recovered but managed only a field goal. * ASU still must learn how to handle a monumental loss and the disappointment that comes with it. It was a big step this season for ASU to succeed in a high-stakes setting, beating UCLA at the Rose Bowl to clinch the Pac-12 South. Graham spoke then and other times of handling success, and ASU seemed to do that well. It didn’t handle significant failure the same way. This should be a learning experience for the returning players and for Graham. While ASU will certainly seek to win on the biggest stage in the future, it should now know better how to handle losing there. * ASU’s offensive line may have been the most inconsistent part of this team. For a line that played together in all 14 games — a rarity given the injuries offensive lines typically face — this unit sure lacked consistency. The group had a handful of stellar performances this season, but Monday’s effort was among its worst. "We did a terrible job protecting the quarterback," Graham said. "We had guys running free, nobody blocking them." Kelly was sacked three times and under constant pressure, with the passing pocket collapsing around him quickly and forcing him to scramble. To Kelly’s credit, he did not make questionable decisions under pressure. Two of ASU’s starting offensive linemen — center Kody Koebensky and left tackle Evan Finkenberg — will be gone next season. With the addition of transfer Christian Westerman, the line gets bigger and stronger. Consistency should be an area of emphasis in the offseason. Texas Tech’s offensive line, meanwhile, had perhaps its best performance of the season, not allowing a single sack and giving Davis Webb ample time to work. * Kliff Kingsbury can really coach. The first-year coach outdid Graham, calling all of Texas Tech’s offensive plays as Graham called ASU’s defensive plays. It was a reminder that experience isn’t everything. ASU may have overlooked Texas Tech and played uninspired football after losing in the Pac-12 title game, but Kingsbury drew up a perfect game plan to take ASU’s usually stout defense out of the game. Tech’s offensive tempo put the Sun Devils on their heels, so much that Graham apparently changed into a bright gold pullover so players could spot him more quickly on the sidelines for defensive play calls. Kingsbury also found mismatches in the ASU secondary and used them to beat the defense over the top. ASU gave up 403 passing yards on the night, easily more than the previous high of 320 it allowed against Oregon State. Assuming both coaches are still in place come 2016 for the first of these teams’ two non-conference matchups, the rematch of Kingsbury vs. Graham should be quite entertaining. 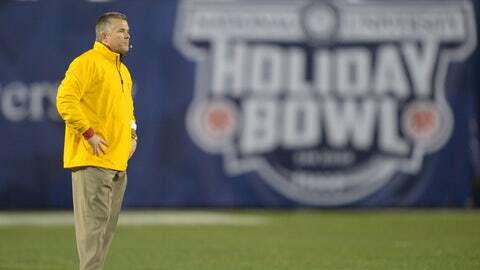 * With the loss, ASU fell to 0-4 in Holiday Bowl appearances. Graham fell to 4-2 in bowl games as a head coach. * While ASU clearly missed its top playmaker in running back Marion Grice, who missed the final three games of the season with a leg injury, D.J. Foster had an outstanding performance in his place. Foster set a career high with 132 rushing yards and a touchdown. He also caught five passes to set a new school record for most receptions in a season (63) by a running back. * Foster’s rushing touchdown gave him one in five straight games after going the previous 20 games without a touchdown on the ground. * ASU also suffered from the absence of starting nose tackle Davon Coleman. The senior, who was tied for the team lead in sacks, did not play in the game due to a violation of team rules. Texas Tech took advantage, running up the middle for significant yards. Sophomore Jaxon Hood started in Coleman’s place. * ASU went without a sack in the game for the second time this season and second time under Graham. Prior to the Notre Dame loss this season, Graham-coached teams had recorded a sack in 32 straight games, dating back to 2010, his last season at Tulsa. * Freshman Zane Gonzalez, despite his hurried miss at the end of the first half, had a solid night. He hit three field goals, including a career long make of 44 yards, to finish the years with 25 field goals made, tying the NCAA record for a freshman set by Kai Forbath at UCLA in 2007. * Westerman, who transferred to ASU from Auburn last December, saw his first action as a Sun Devil. Because he was a mid-year transfer, Westerman was eligible for the bowl game. He played on ASU’s kickoff return team in the second quarter and later saw action on the offensive line. * ASU eclipsed its game average for penalty yards (29.23) in the first quarter by committing four penalties for 30 yards. It finished the game with seven penalties for 59 yards, effectively twice its average. * Kelly and Foster both rushing for more than 100 yards gave ASU its first 100-yard rushing tandem in a game since 2001.